Our Lady of Mount Carmel Church, formally St. Charles Mission Church, under the care of Heeia Mission Community from 1867, was torn down and rebuilt. On December 17, 1939, Bishop Stephen Alencastre blessed and dedicated Our Lady of Mount Carmel Church. In 1841 Father Louis Maigret, the Vicar delegate, divided O`ahu into missionary districts. Father Martial Jan was assigned to supervise the Ko`olau districts divisions. By the early 1850’s the windward coast of O`ahu was dotted with chapels in Opana, Kahuku, La’ie, Kahana, Papa`akoko, Mokapu, He`eia, and Waikane. The native style chapels were of simple construction covered with pili grass, and Father Jan visited them on horseback or by canoe. In 1865 Sacred Heart brothers under direction of Brother Calixte Lecomte began to build and frame the chapel at Waikane. Completed in 1867, it was blessed by Bishop Maigret and dedicated to St. Charles. St. Charles church belonged to the district of He’eia and the priests assigned to St. Ann’s church visited periodically. Sunday masses were generally taken care of by the priests-teachers of nearby “Ahuimanu College” from its beginning in 1864 until it closed in 1878. For almost three-quarters of a century St. Charles was a well-frequented mission. Unfortunately, the many epidemics that decimated the Hawaiian population reduced the population of Waikane to only dozens of families. The busy pastor of He`eia continued to conduct services in the old chapel monthly, more frequently during Lent. In 1939 Father Anthony O’Brien, then in charge of He`eia district received permission to tear down the old dilapidated chapel and build a new one. On December 17, 1939, Bishop Alencastre blessed and dedicated Our Lady of Mt. Carmel. It was not until 1968 that Bishop John Scanlan created an independent parish and appointed Father Gabriel P. Vanden Broucke as first pastor. Subsequent pastors have been Father Iedephonse Kunz (1971-1976), Father Louis Boynaemas (1976-1980), Father Matthew Alencastre (1980-1983), and Father Gerard Leicht (1983-1985). These were all Sacred Heart priests. In 1985 Father Raymond Churchill became the first Diocesan priest assigned as pastor. He was succeeded by Father Paul Evers (1987-1990) and Father Roland Pacudan (1990-1992). From 1992-1994 Father Randy Nowak O.F.M. Cap., a Capuchin Franciscan, was pastor. He was followed by Father Alfred Rebuldela (1995-1996), Father Romero Rabusa (1996-1998) and Father Eugene L. Keusal (1990-2003). In 2003 the parish of Our Lady of Mount Carmel was clustered with the mission chapel of Sts. Joaquin and Ann in Punalu`u and the parish of St. Roch in Kahuku. Father Sydney Fernandes was made the parish administrator and oversaw their needs. Our Lady of Mount Carmel was restored as an independent parish when it was de-clustered and Father Paulo Kosaka O.F.M. Cap., Capuchin Franciscan was appointed as the parish administrator on July 1, 2008. A Capuchin fraternity now exists in the parish with the arrival of Father Bob Maher O.F.M. Cap. (September 2008 – July 2009) and Father Marvin Bearis O.F.M. Cap. (December 2009). This forms a small Capuchin fraternity in the parish of Our Lady of Mount Carmel for the first time. On October 16, 2016, Fr. Paulo Kosaka was appointed Pastor by Bishop Larry Silva at the 7:00 a.m. Sunday Mass. 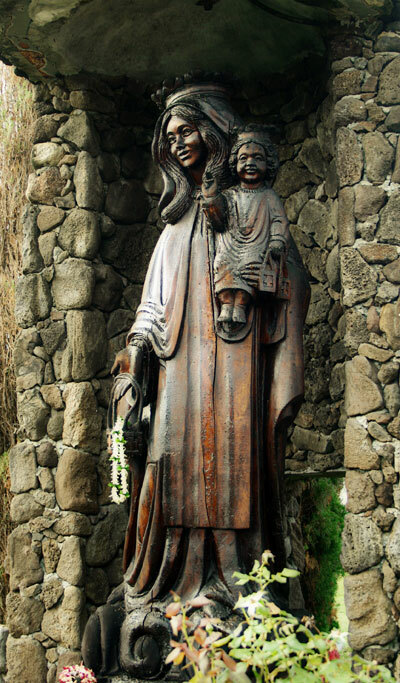 Wooden Statue of Our Lady of Mt. Carmel...A labor of love, was carved by Louis Benanto, in 1986, from Koa logs shipped from Mauna Kea on the Big Island. The Our Lady of Mount Carmel bell, now approximately 170 years old, was given to Fr. Martial Jan by the people of Nantes, France. Father Jan arrived in Hawaii in November 1840, and was assigned to the Catholic community gathered at Heeia, the core of who had escaped persecution spurred by Protestant favoritism in urban Honolulu. He served with "superhuman" strength, building the church community and school in Kaneohe and teaching at Ahuimanu College until his work was curtailed by poor health in 1871. 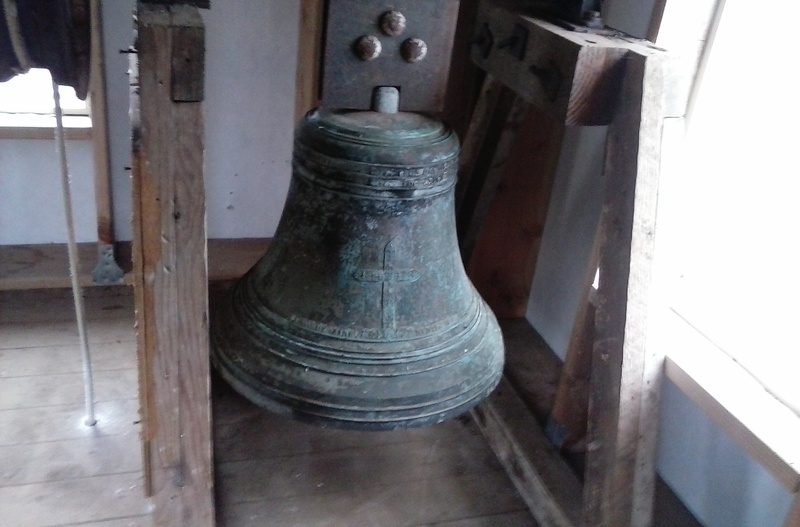 The bell is inscribed with a message from the people of France that identifies the bell as a gift to "Monsieur Jan Martial, missionary to the Sandwhich Islands, giving at Nantes, 1845."